Chalk up a win for pollsters — and Wall Street. The U.S. midterm elections went as predicted: the Republicans retained the Senate, while the Democrats gained control of the House of Representatives. By and large, strategists weren’t willing to stick their necks out and issue high-conviction calls on the outcome after being bitten twice in 2016 after votes for Brexit and President Donald Trump that didn’t go according to expectations. 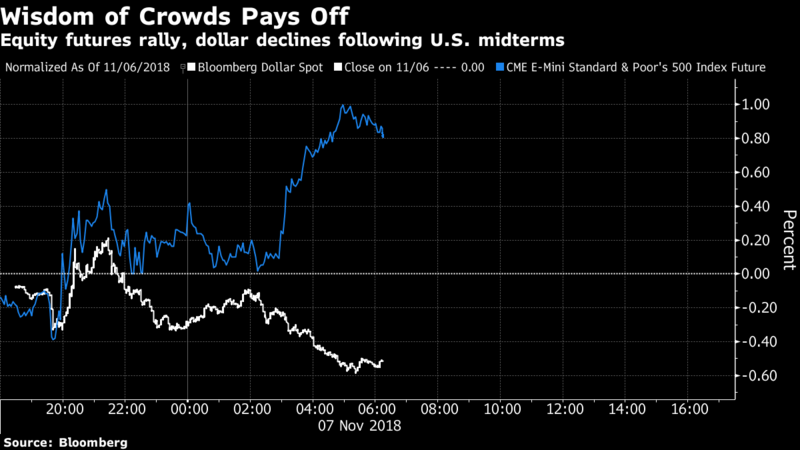 But the two main consensus views on what awaited markets after the midterm vote — U.S. dollar down, stocks up — have been vindicated big league in early going Wednesday. TD Securities, Bank of America and Societe Generale proffered the thesis that a split U.S. Congress would put the greenback on its back foot, anticipating the likelihood of an enhanced fiscal boost would diminish. As of 6:25 a.m. ET, the U.S. dollar is the worst-performing G10 currency, with the Bloomberg Dollar Spot Index off more than half a per cent. The sell side’s batting two-for-two so far.